Rumours are continuing to circulate that China is going to regulate all crypto. The rumours include closing down mining and chopping off Bitcoin itself in the great fire wall (GFW) that controls the in/out pipes for the Internet. However, one letter circulated that claims all this appears to be a fake, but it’s scared many nonetheless. Can they shut down the mining? Probably, and to much larger extent than the other governments. The reasons are twofold – censorship is a normal part of life there, and the regulations are much stricter, so (1) censorship works. If you couple this to the fact that the mining companies are big and consume a lot of resource, then we can see them as obvious – (2) big hash factories are hard to hide. Therefore, it is fairly likely that an instruction to cease & desist will be taken seriously. And voluntarily. And there won’t be any mucking around with secret nets or pigeon IP or ham radio. So, the potential attack on Bitcoin and Ethereum is plausible, notwithstanding the likely fake news status of it right now. The ramifications are that about 80% of the mining hashpower would be sliced off, as well as Bitcoin use being isolated within the country. One could even see a potential for Bitcoin to fork into in-country and ex-country chains, something that would align with PRC interests but maybe not with anyone else. Curiously, and arguably intentionally, DPOS is more or less immune to this attack. The reasons are simply that (a) DPOS is far more decentralised than mining and (b) DPOS responds to the shock of country regulation quickly and without losing any efficacy. Mining is more centralised because the forces of centralisation (or economies of scale) on it are much stronger: Bitcoin and Ethereum mining need huge amounts of electricity. As outlined in an old paper (Güring & Grigg 2011), hashing goes to where the electricity is cheapest. Which currently is in places like Inner Mongolia for various reasons that aren’t going away. Further, it’s not enough to have a few boxes and great net, you have to be a big warehouse. Which means we know where they all are, and they can’t move, easily. Lots of electricity, lots of boxes, lots of money, lots of workers: These are highly centralised installations. In contrast, the resources used in DPOS are much lighter. They aren’t as subject to local circumstances, and are much more easily moved. Basically, each block producer needs a few big boxes with good net. Which exists in most countries, there are even hobby/volunteer sites like Funkfueur in Vienna that would fit the bill, and many countries deliver real fast net to the home with fibre which would likely be enough for a year or two. More, the producers can be re-appointed by the community within the space of a round – approximately a minute. So the moment a large country decides to act, the community can respond as and when it is bothered – by voting to replace the suspect nodes with others ex-country. This can be done on rumour, or we can wait until those nodes drop off, and then repair the network knowing where to repair. All this with zero change to the effective block production, and the risk to that production, because there is a ready pool of waiting block producers. Whereas a successful China attack will result in an 80% drop in hashrate around the world and thus the potential for a fork. That’s the theory – how do the numbers stack up? 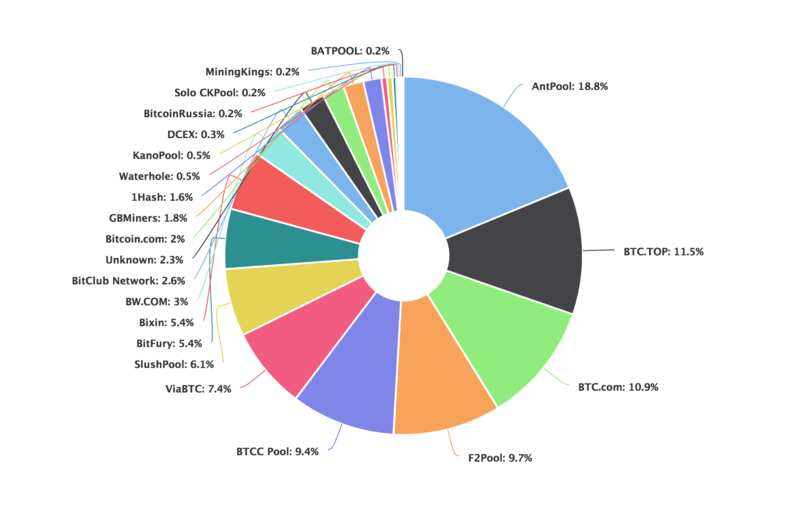 If we choose 75% as a suitable indicator of effective decentralisation, we can eyeball the chart (above) and see that 8 mining pools do 75% of all hashing for Bitcoin. Ethereum (below) is even worse at 5! Meanwhile, DPOS is mathematical as the blocks are distributed 1 per round across 21 producers, each round, and then shuffled. Then, 75% of 21 producers is … 16, rounded up, as it was with the others. Hence, DPOS is far more decentralised than either Bitcoin or Ethereum, by a factor of 2 or 3 if the 75% metric is any guide. The fact that there are many thousands of nodes in a Bitcoin or Ethereum blockchain isn’t relevant if the chain is dominated by only a small number of pools, and those pools exist in known, accounted-for places vulnerable to a forking attack. Like China. Like 80%.